Tired of fighting the crowds to get at call-educated coyotes? Try taking a walk. Coyote deal with human activity by avoiding it — seeking remote hides where human encounters are rare. Those that hang out close to public roads, ranches and farms aren't long for this world, or become paranoid, since they are shot at by every passing pickup. That's why hunting the outback can put you in position to exploit coyotes that are relaxed and might just let down their guard. Look for patterns in their behavior and travel routes. Most revolve around a food source, which might be rodents and birds living in the decaying ruins of an old farmstead; dead livestock in the back 40; manure in the stockyards; or afterbirth during calving season. Coyotes are creatures of habit when undisturbed. If a food source remains constant and they don't feel threatened, they will return until it's depleted. Early morning glassing, or driving ranch roads, stopping occasionally to hit the howler, can help determine what predators are doing and when. You might be surprised how predictable they are, often taking identical routes day in and day out at the same time each morning. Once you determine food sources and travel routes to and from that source you can put your plan in place. Many times it's not practical to hunt the actual food sources because they are hitting them at night or they are too close to farm buildings or livestock. But you can hunt the back country they retreat into, where they spend their days loafing, guard usually down. Cross-country coyote hunting requires tracts of land, preferably uninterrupted by public roads. Locating such places shouldn’t present an obstacle. Let's look at private land first. 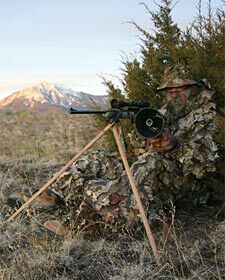 Hunting private property requires trespass permission, either free or for a fee. Here's where PR skills come into play. If you're hunting close to home, check out relatives, friends, friends of friends, etc. who own land. Often, a considerable amount of huntable land is only a shirttail relative and a few questions away. Knock on doors. I've met many ranchers and farmers who aren't fond of coyotes, and most will grant you permission if you obey the rules (close gates, stay away from buildings, cattle, etc.). Gates closed to big game hunters are often eagerly opened to predator hunters who will relieve the landowner of his coyote problems. 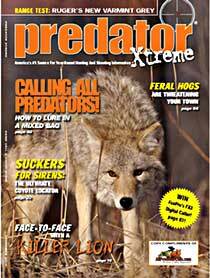 Pump them for information on any coyote sightings or dead livestock that might be on their property. (Note: Ranchers/farmers often provide an exaggerated estimation of the number of coyotes they have on their property.) If you can get them to show you the boundaries of their property then you can scout on your own. Armed with a good road map and county plat book, you can quickly figure out who owns what piece of property and where they live, narrowing down your search considerably. Once I get permission from one landowner, I'll pay a visit to his neighbors. Most are less hesitant to grant permission once their neighbor has given you the green light. There is no shortage of public land to hunt if you do a little homework. Bureau of Land Management (BLM) holdings, U.S. Forest Service and Fish and Wildlife lands, federal grasslands, state-managed WMAs, etc., combine to provide access to millions of acres that’s largely vacant once other hunting seasons are over. The best time to pursue coyotes is when fur is prime and competition for these lands is low. More than 80 percent of Arizona is publicly owned. The BLM administers 12.2 million acres in Arizona, open to hunting unless otherwise designated. Gerry Blair and I used to pull his trailer into the high desert, set up camp and hunt all things furry for a week or more at a time. There was always new territory to explore and rarely any competition from other hunters. The grasslands of North and South Dakota are inundated by upland bird hunters each fall, but are largely vacant once these seasons close. This opens huge tracts of land to predator hunters who aren't afraid to get out and do a little walking. In the East and the South, lands managed by the National Forest Service and state WMAs provide a good starting point for accessing huge sections of huntable lands. For a higher level of predator-hunting efficiency, bring a buddy and his truck. I use two approaches, and each requires two vehicles. Let's say you have a large tract of road-less land. The rancher gave you hunting rights, but says absolutely no motorized vehicles are allowed: no trucks, no snowmobiles, no ATVs. I hunted a piece of property like this up in Alberta. It was seven miles between roads with nothing in between but rolling pasture. It doesn’t take a biology degree to figure out that the majority of the animals on a piece of property such as this — predator and prey — will be hanging out toward its inner core, away from the roads. To hunt as a team, drop one vehicle off on one side of the property, then drive to the other. Now, hunt from one truck to the other, zig-zagging through the heart of the property. If the land is broken up by rough terrain or lots of vegetation, you can set up every quarter-mile or so. Even if there's only a mile between trucks, you can get three or four good stands in. If you want to cover more ground, park on opposite sides of the property and hunt your way to each other’s truck. If the trucks are parked north to south of each other, one of you can veer east while the other hunts to the west so you don’t overlap. If you're unfamiliar with the property, GPS and mark the trucks so you can work directly to them. At least, bring a compass so you can cut the opposite road. Arrange a meeting time and place … and don't forget to exchange spare keys! The next time you're planning a coyote caper in your backyard or out-of-state, think big. The key to catching coyotes unaware is to hunt them where they least expect it, and that means leaving the truck behind and hiking the coyote outback. There are many sources for maps to public land. Once big game, waterfowl and upland game seasons are over, these public lands are largely underutilized. Here are a few to get you started. Bureau of Land Management While it's true that the majority of the land the BLM manages is west of the Missouri River, this agency controls land throughout most of the United States and publishes maps for most of its holdings. U.S. Forest Service Free regional Forest Service maps are available from the Public Affairs Office of each of the agency's regions in the United States. Public Lands Information Center This is a searchable database of publicly held land throughout the West. U.S. Fish Wildlife Service This agency controls lands open to public hunting throughout the United States. Wildlife Management Areas Contact your state wildlife management agency for information and maps regarding state WMAs.